We may live in a digital world but there are still times where nothing beats a "old fashioned" business card. But that doesn't mean you can't use a business card with a digital twist. How would you feel if someone gave you a business card you can simply tap on your screen to get a digital version of it? 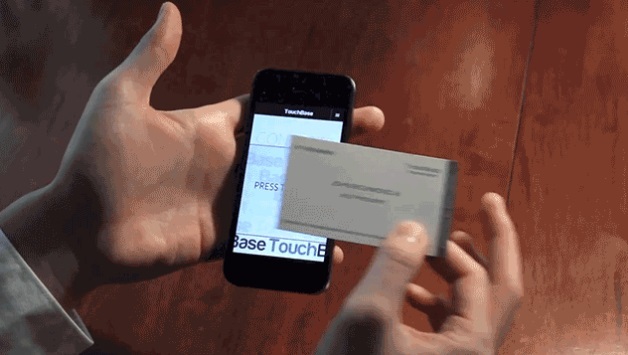 Yes it sounds like magic, and right now you'll be thinking it's a NFC enable business card... until you notice it works even in non NFC smartphones like the iPhone. So... how the heck are they doing it? The trick is quite clever. These TouchBase business cards have a specific pattern on their backs using conductive ink that your smartphone touchscreen can read as a multitouch gesture. Then, a simple webapp can translate that specific pattern into the actual digital vCard with the right contact information. Costing $25 for 36 cards (though they can get cheaper for larger quantities), these cards aren't as inexpensive as you'd wish. But if you're looking for something that will make you stand our from the rest of crowd using regular business cards, this might be just the thing you'd need. Deliveries are expected for March should this Indiegogo project be successfully funded.